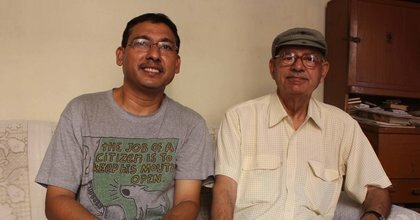 L.R.Balley is the veteran editor of Bhim Patrika being published from Jalandhar. One of the very few Ambedkarites who worked with BabaSaheb Dr B R Ambedkar, Balley has carried the legacy of Ambedkarism since 1956 till date. He has written hundreds of books on the thoughts and life of Dr Ambedkar and has dedicated his life to the mission Ambedkarism. Bhim Patrkia is published in Punjabi, Urdu, and Hindi. Vidya Bhushan Rawat has a candid conversation with L R Balley over a wide range of issues concerning the nation and its people. This conversation shall cover vital and vast issues related to Ambedkar, Independent Labour Party, Schedule Caste Federation and Republican Party of India. L R Balley also gives new insights into the Annihilation of Caste discussions and broadens the perspective. He just stops before calling it a prophecy by Ambedkar about revolution to happen in future and explains how the current day regime has laid all foundations for a revolution to happen. Sourcing Ambedkar’s own writings and speeches. He provides information on land reforms in Punjab, the works of Arya Samaj in Punjab with respect to education and health benefits in the 50-60 era. With his vast amount of database of knowledge and information L R Balley negates the discussions on Mulnivasi. He also gives insights into the health conditions of Ambedkar just before his final adobe. Do Educational Institutes need lectures on Patriotism?